Cooking and me is a date always! 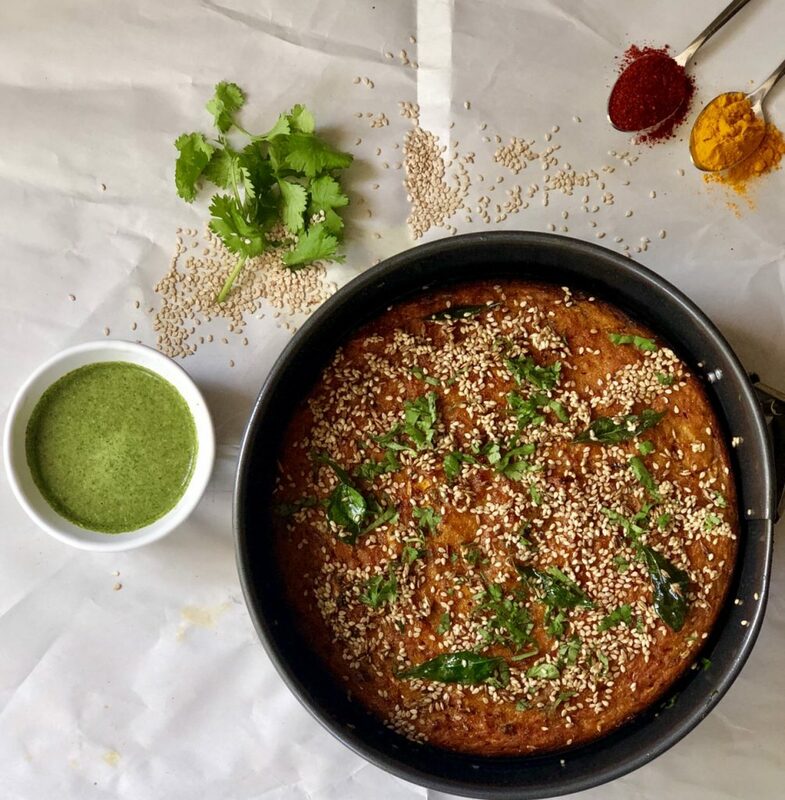 Baked lentil cake sound nutritious on its own and this recipe is a whole meal in itself with rice, lentils, veggies, sesame seeds and spices to add flavor. This is my version of a traditional Indian snack called Mixed Dal Handvo. I load up the batter with grated veggies. 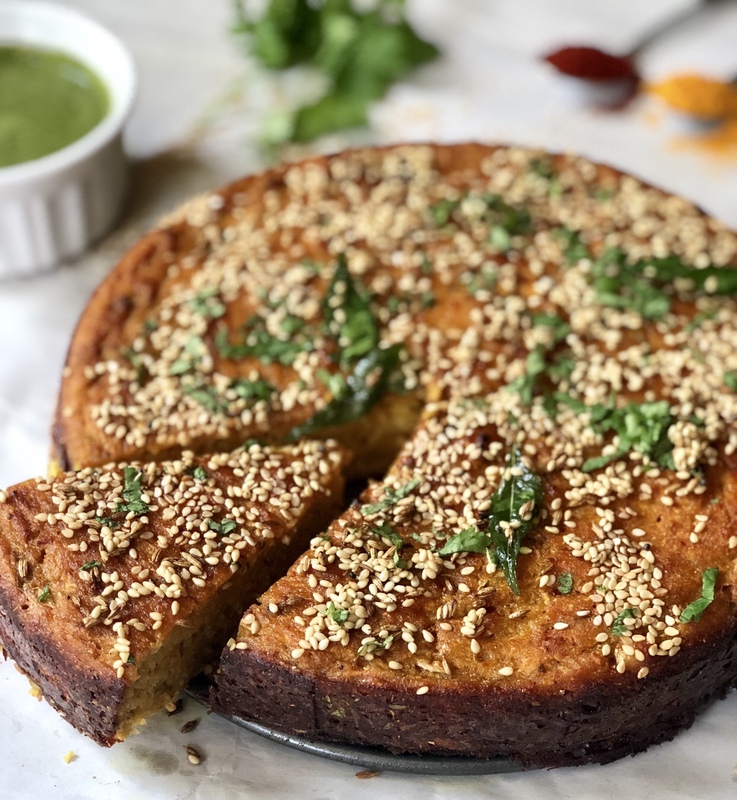 Grated bottle gourd is an important ingredient in this recipe, as it gives softness to the lentil cake. Another secret of mine to make this recipe even better – I save the juice released while grating the bottle gourd. This juice is loaded with nutrients and so instead of discarding I add it to my batter. But as I am going to use this juice in the batter, I am careful with the amount of water while blending lentils. With the right amount of ingredients and baking time, the lentil cake turns nice and crispy on the outside but very soft on the inside. Wash and soak the rice and lentils together for 5-6 hours. Drain the water and grind these soaked lentils and rice together into a smooth paste. Be careful about the amount of water you use for blending, you want a thick batter so add water gradually if required. Transfer this mixture to a bowl, add yogurt and mix well. Cover and let it ferment overnight. When you are ready to bake the cake, add the grated bottle gourd, carrots, and cabbage. Then add lemon juice, soda bi-carb (optional), all the spices and mix well together. Pre-heat the oven at 350° F. Grease a baking pan using cooking spray on the bottom and sides. Gradually pour the batter into the pan making sure you have room in the pan for the batter to rise. Sprinkle sesame seeds on the top. Bake for 35-45 mins. If you want a crisp layer on the outside, you can set the oven to broil for 5 mins towards the end. Once, done place the baked cake on a cooling rack. Optional – Heat oil in a non-stick pan, add mustard seeds. When they splutter, add curry leaves, cumin seeds, and sesame seeds. Garnish the cake with this tempering and serve warm with green chutney or ketchup. You can skip the tempering if you want to cake to be oil-free.